Foot gout is a common problem and is characterised by sudden intense pain, often starting at night with no warning. The classic signs are localised pain, swelling, redness, heat and tenderness. 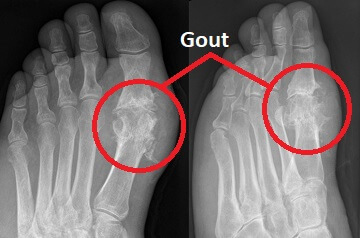 Foot gout most commonly occurs in the big toe but can affect other parts of the foot and ankle. Here we will look at what is going on during foot gout attacks, common symptoms and diagnosis tools, risk factors and treatment options, and the best prevention strategies for avoiding gout flares. Gout is the most common type of inflammatory arthritis and is caused by a build-up of uric acid crystals in a joint. Uric acid is a natural product that is constantly being produced when the body breaks down chemicals known as purines found in foods such as meat and seafood. This helpful video from Healthline gives a good overview of gout. Normally, uric acid is filtered and removed through the kidneys and doesn’t cause any problems. However, sometimes the kidneys can’t remove the uric acid quickly enough or the body just produces too much of it. Over time, this leads to the formation of sodium urate crystals, usually around one of the joints in the body. The tiny crystals are shaped like hard, spiked rods. Initially, there are no obvious symptoms, but as more crystals accumulate (which may take years), they can start to cause problems. If these crystals enter the joint, they irritate the joint lining, triggering an inflammatory reaction, causing intense pain, redness and swelling around the joint. Foot gout most commonly occurs at the base of the big toe, known as the metatarsophalangeal joint. Gout affecting the big toe accounts for over 50% of cases of the disease and is also known as Podagra. The most common symptoms of foot and ankle gout are intense pain, swelling, redness, heat and tenderness over the affected joint. Symptoms from foot gout often start suddenly and progress rapidly over a few hours, particularly at night-time. This is thought to be due to people having a slightly lower body temperature at night. 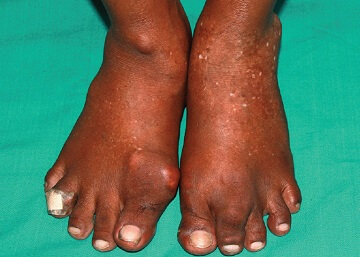 In severe cases, foot gout symptoms may also include fatigue and a fever. 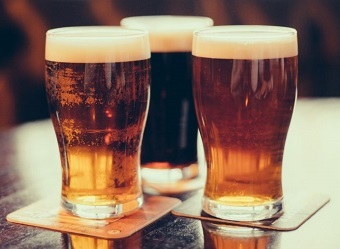 The symptoms of gout usually last between five and ten days. Gout tends to affect the extremities and Podagra, where it affects the big toe is the most common place to get symptoms of the disease, but people can also suffer from ankle gout or even further up the leg with gout knee. The upper limbs may also be affected, most commonly the fingers, wrists and elbows. 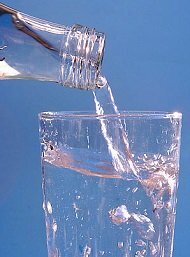 It is thought it most commonly occurs in the extremities as they tend to be the coldest parts of the body, which increases the risk of sodium urate crystal formation. 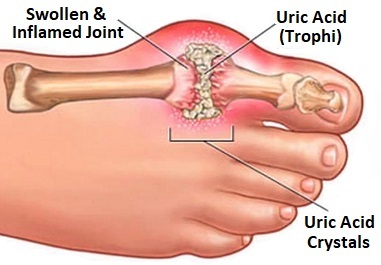 People who suffer from recurrent episodes of gout, or who have high levels of uric acid for a number of years, often acumulate a large number of urate crystals which form lumps or masses known as "Tophi". Tophaceous gout can cause bone damage as the tophi erode bone and cartilage. Whilst tophi tend not to be painful themselves, they can get inflamed and people are often distressed by their appearance. Gender: Men tend to suffer from the condition at a younger age than women due to higher levels of uric acid. After the menopause, uric acid level rise in women increasing the risk of the condition and only 15% of female sufferers are pre-menopausal. Over the age of 60, the risk of developing the disease is equal between the two genders but over the age of 80, it is more prevalent in females. Accurate foot gout diagnosis starts with the doctor asking questions about your symptoms such as when and how they started, previous episodes, diet and any family history of the disease. Foot gout treatment starts by addressing the pain associated with the flare up. Once the symptoms have subsided, further treatment concentrates on lowering uric acid levels to prevent further attacks. Foot gout prevention aims to reduce the number of flare-ups people experience by reducing the levels of uric acid. This can be done with medications of lifestyle changes. Whilst podagra is one of the most common causes of big toe pain, there are a number of other things it could be. If foot gout isn’t sounding quite like your problem, visit the foot pain diagnosis section for more help working out what is wrong and what you can do about it.